The discomforts of the transitional stages of menopause can reduce the pleasures women enjoy on a regular basis. 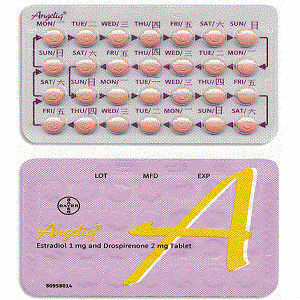 That is why Angeliq has created a pill which can help women fight the symptoms and start enjoying life again. With two different strengths, one to stop night sweats and hot flashes and one with additional relief from vaginal dryness, itching, and burning, Angeliq may be the answer to menopause. However, before coming to any conclusions, we must take a look at its mechanics. Whether a consumer is taking the .25mg dosage (for hot flashes and night sweats) or the .5mg dosage (to additionally treat vaginal discomfort), women should take 1 tablet daily. There is no indication as to when this tablet should be taken or if it should be consumed with food or water. A specific price could not be found for this product due to the fact that it is a prescription only medication. Prices will vary depending on pharmacy and individual coverage. No guarantee accompanies this product, a commonality for prescription medication. After reviewing the researched information listed above it has been concluded that several concerning factors accompany Angeliq. The first concern is the benefits. As stated above, different strengths of Angeliq are prescribed for different sets of symptoms. However, even with an increase in dosage, there is none that can provide women with entire relief. Because of this factor, other supplements and vitamins will have to be obtained, thus increasing the daily intake of tablets. A second concern is the rather large list of side effects and risks. Women in menopause have enough symptoms and do not desire to risk more discomfort. Additionally, the risks of taking this medicine could definitely far outweigh its benefits as many of its risks could result in fatality. Jackie Horowitz	reviewed Angeliq	on April 30th	 and gave it a rating of 2.